Blurbs for The Bitter Kingdom! I am so, so pleased to finally be able to share a couple of amazing blurbs for The Bitter Kingdom, the third and final book of the Fire and Thorns trilogy, which will be released on August 27, 2013. “What’s a blurb?” you ask. It’s when someone Important or Influential reads something and likes it enough to say an Official Nice Thing about it. Like an endorsement. Except not paid. Unless you count undying gratitude as currency. Which I do. Aaaahh!!! *flail* Marie Lu and Beth Revis!!! I’m so excited and grateful and blown away. Thank you so much, ladies. 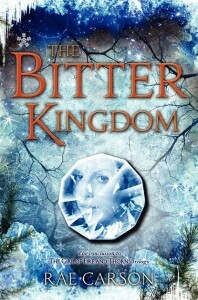 20 Comments on Blurbs for The Bitter Kingdom! Advance copy you say? Well I’ll be stocking your facebook and blog tomorrow. Such exciting blurbs! I have been telling everyone I can about this series. I absolutely love it and I am SO anxious for August!!! Were you aware that a terno is a traditional Filipino dress? which blog platform are you using for this site? I’m getting fed up of WordPress because I’ve had problems with hackers and I’m looking at alternatives for another platform. I would be fantastic if you could point me in the direction of a good platform. written article. I’ll be sure to bookmark it and come back to read more of your useful info. Thanks for the post. I’ll certainly return. i absolutely can’t wait for the new book to come out.. i fell in love with the books already i wish that there was more than 3 🙂 i don’t want it to end. hi!,I love your writing very a lot! share we be in contact more about your article on AOL? I need an expert in this space to unravel my problem. Maybe that is you! Having a look ahead to look you. It is actually a nice and useful piece of info. I’m satisfied that you simply shared this useful information with us. Please stay us up to date like this. Thanks for sharing. 1Pingbacks & Trackbacks on Blurbs for The Bitter Kingdom!